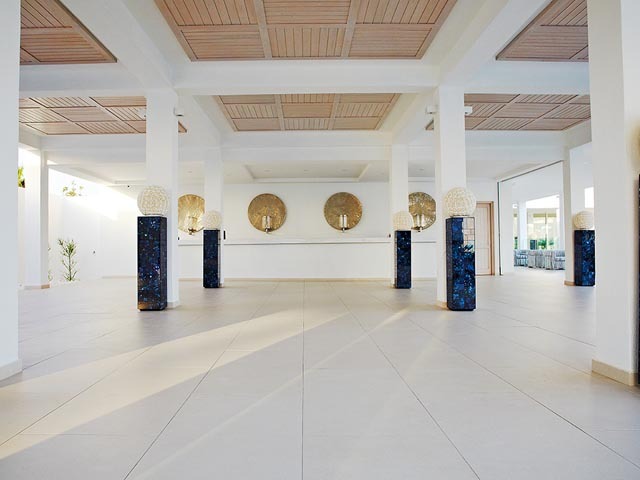 Breathtakingly exotic yet comfortably minimal, the White Palace in Rethymno is as close as you get to a glimpse of the future. The plain colours and simple furnishings enhance the feel of sea and sky. The food is authentic and delicious, and the service is impeccable, but relaxed. 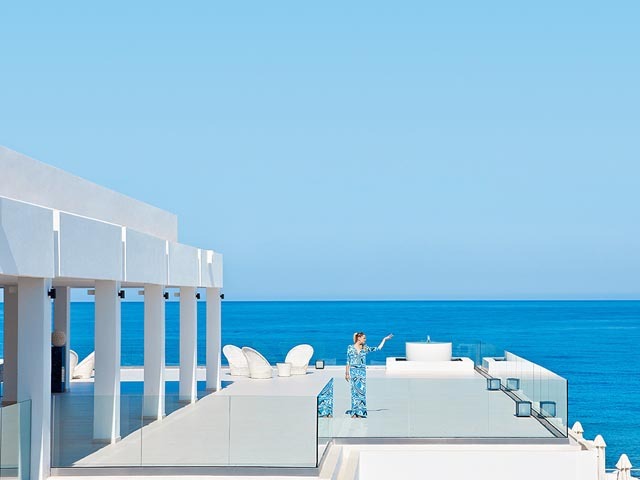 The newly renovated The White Palace (El Greco) is a unique resort perched on the Cretan Riviera near Rethymno; just a heartbeat away from the medieval atmosphere of Rethymno’s old town, with its picturesque alleys and its Venetian fortress, while its sandy beach extends over 17km. 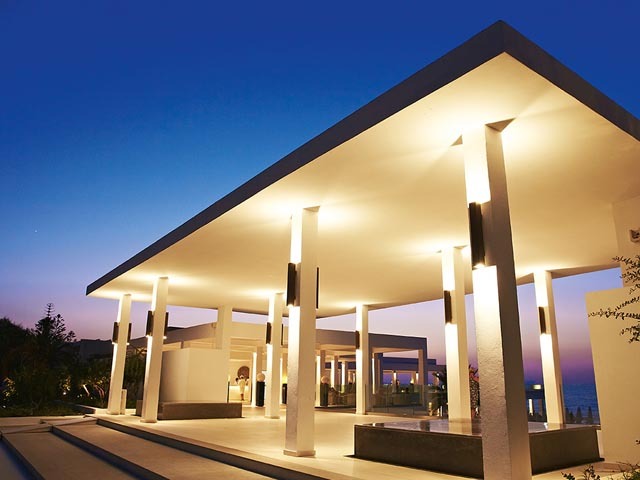 During the initial phase of total renovation in 2013, the landscaped exteriors, impressive entrance gallery and open air interiors were lifted to fresh heights. 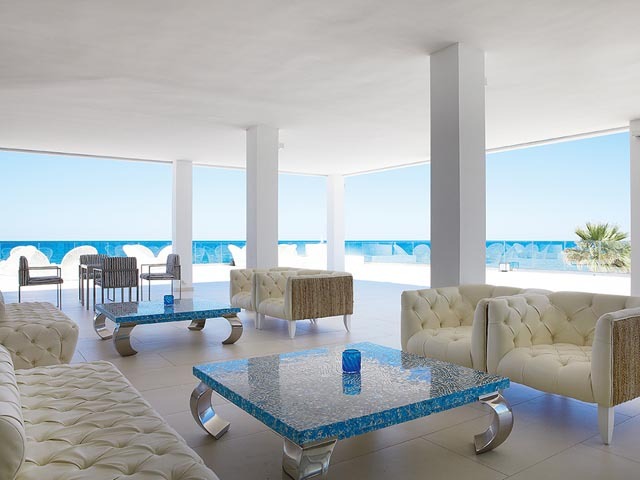 Inspired by the blues and whites of Greek Islands, the minimalistic architecture is accented with handcrafted furniture. 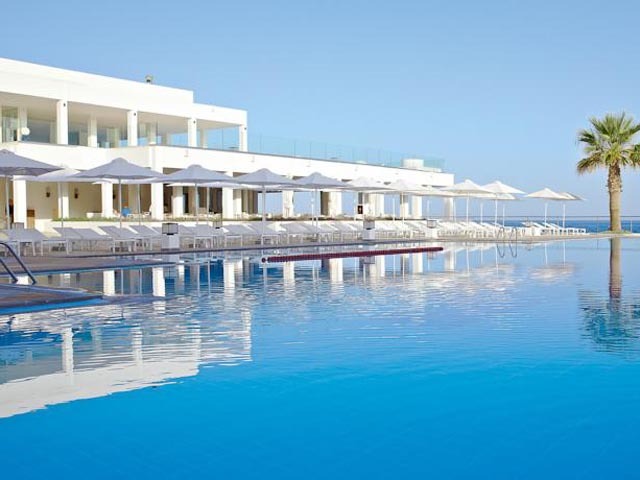 New restaurants, bars and upgraded new accommodation are the hallmark of the remodelled The White Palace (El Greco). Enjoy romantic sunset from the terraces and gaze at the twinkling lights of Rethymno, as your children are having the time of their lives with the friends they made at Grecoland. 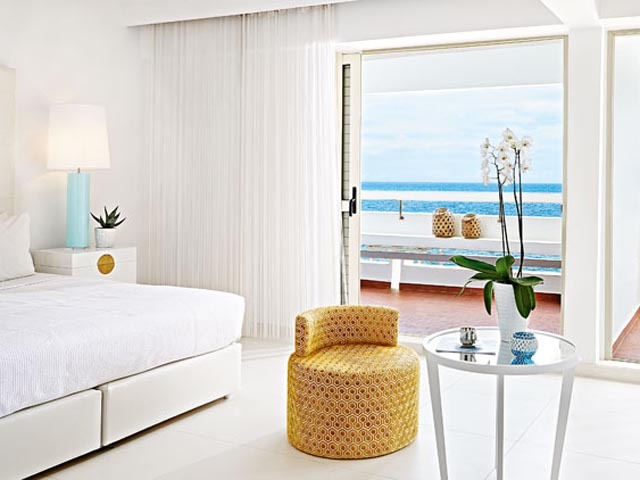 These comfortable Mediterranean-style rooms draw upon the soft hues of sand and sea with custom designed furniture and designer fabrics in a tasteful contemporary style. Aqua-coloured mosaic side-tables and consoles, emerald-green and apricot touches punctuate the cool white interior. These guestrooms feature a king size bed or twin beds, an additional comfortable sofa bed and en-suite bathroom. 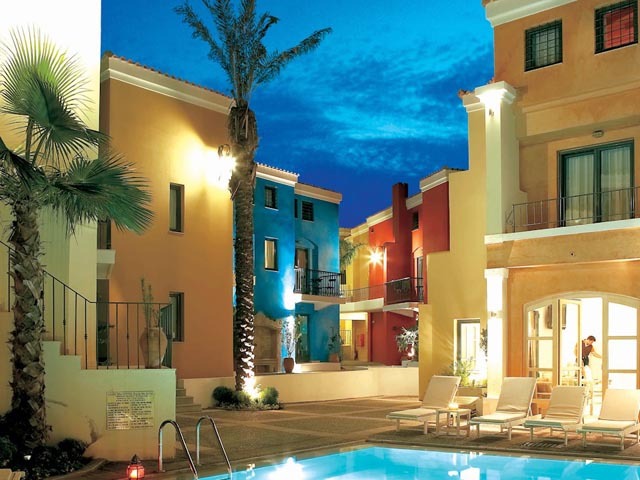 They offer beautiful views of the legendary Cretan landscape and the resort’s gardens. NOTE: Guestrooms are sample and some room features may differ. Completely updated and ideally located elegant guestrooms boast amazing views of the Cretan Sea. Open plan master bedroom with a king size bed and brand new mood-evoking décor featuring custom designed furnishings with aqua colored mosaic side tables and consoles. A daybed is set next to the large glass doors - ideal for reading or just daydreaming. The stylish decoration and fabrics in varying shades of ivory, cream and turquoise provide an ideal holiday retreat. 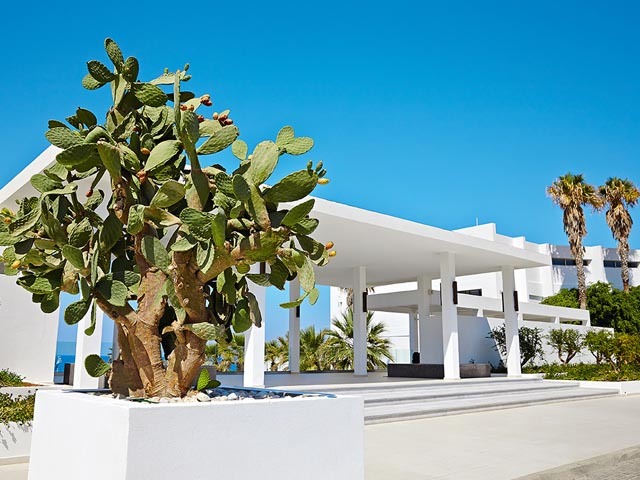 They feature a private bathroom, floor-to-ceiling windows overlooking the sea and spacious fully furnished covered balcony with panoramic views. 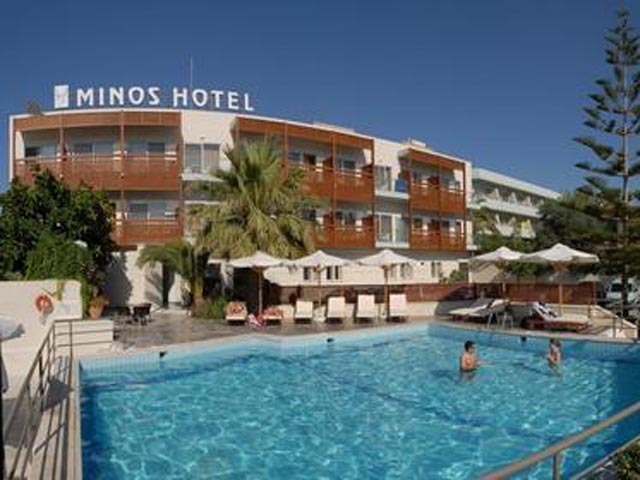 A completely updated spacious and ideally located guestroom that boasts amazing views of the Cretan Sea. Open-plan Master Bedroom with a king-size bed and brand new mood-evoking décor featuring custom designed furnishings including aqua mosaic side tables and consoles with sleek metallic surfaces. 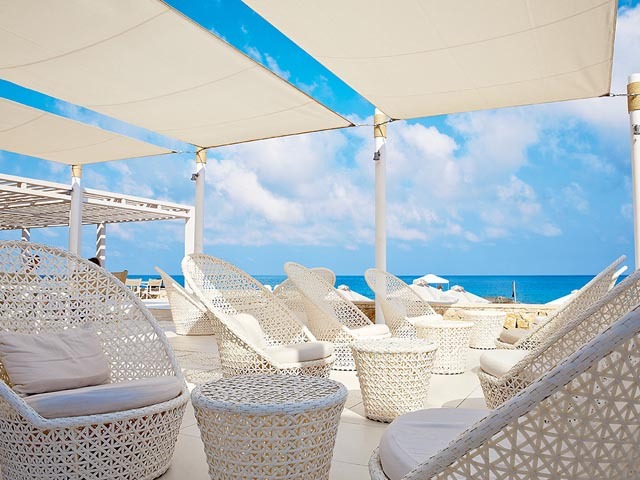 The stylish decoration and matching fabrics in shades of ivory, cream and turquoise provide a lavish holiday retreat. They feature a private bathroom and separate walk-in shower with direct sea view, floor-to-ceiling windows overlooking the sea and spacious fully furnished covered balcony with panoramic views for endless relaxation. 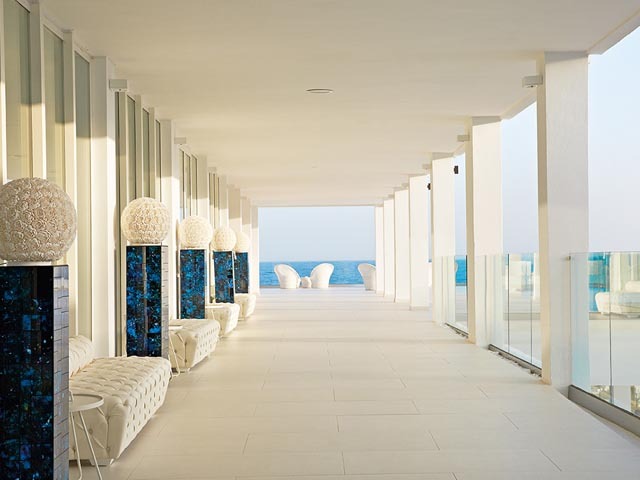 Spacious new guestrooms with stunning sea views that capture the beauty and essence of the White Palace. Ideal for young families the spacious Luxury Sea View Guestrooms draw upon the soft hues of sea and sand with custom furnishings featuring aqua mosaics and contrasting fabrics in varying shades of blue. Open plan master bedroom with king size bed and en suite living area featuring a comfortable sofa that can be converted to a child’s bed. Private bathroom provides bath and spacious vanity unit. Amazing walk-in shower with breathtaking sea views and ample dressing area enrich the comforts of the guestroom. 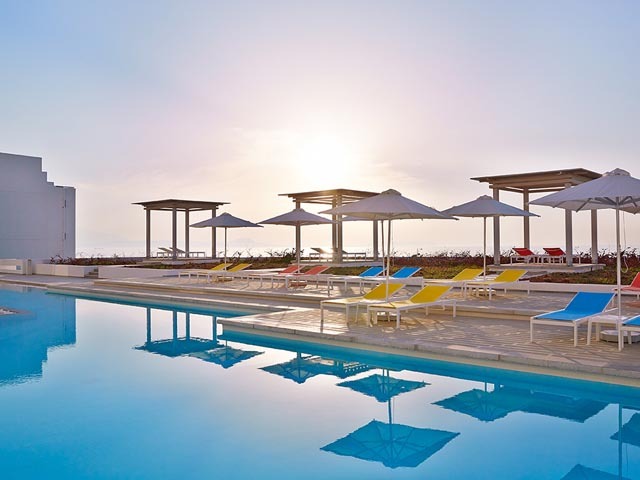 They have floor-to-ceiling panoramic windows and an oversized covered balcony with comfortable outdoor furniture overlooking the breathtaking Cretan Sea. A refurbished guestroom nestled among gardens, designed with life’s luxuries and the flair of al fresco living. The Prestige Bungalows are framed by a seafront garden area so you can soak up the eternal Cretan landscape. Master bedroom with private bathroom and king size bed; brand new mood-evoking décor featuring custom designed furnishings including aqua colored mosaic tiled side tables and consoles. The stylish decoration and fabrics in varying shades of ivory, cream and turquoise with sky blue accents provide a lavish holiday retreat. Separated by sliding panels the sea front living area features a dreamy large sofa bed, while floor-to-ceiling large glass doors offer seamless transitions between indoor and outdoor summer living by the beach. Time for a dip in the pool? Book a Prestige Sea View Bungalow and you can simply step off you own private sun terrace into the water, since these updated cosy guestrooms boast zero access to the resort’s Exclusive Pool. Master bedroom with private bathroom and king size bed; brand new mood-evoking décor featuring custom designed furnishings including aqua coloured mosaic tiled side tables and consoles. The stylish decoration and matching fabrics in varying shades of ivory, cream and turquoise with sea & sky blue accents provide a lavish holiday retreat. Separated by sliding panels the sea front living area features a dreamy sofa bed, while floor-to-ceiling large glass panels offer seamless transitions between indoor and outdoor summer living by the beach. Spacious family accommodation featuring a master king size bedroom with modern hand carved furniture and delicate fabrics in bright summer colours. Sliding doors lead to the light-filled living room with front balcony which serves as a relaxing lounge or a second bedroom with two sofa beds for children (selected rooms). These rooms offer beautiful views to the lush gardens and everlasting Cretan landscape with floor-to-ceiling glass doors. En suite private bathroom. New Family Apartments are a special class of accommodation, with added comforts for families traveling with children or group of guests, as they offer separate sleeping areas, two bathrooms and newly renovated interiors. Leading off a small lobby is the spacious living room featuring handpicked wooden furniture and fabrics in bright summer colours. This spacious room opens to a private balcony and serves as a relaxing lounge or a second bedroom with en suite private bathroom. Separate master bedroom with king size bed, aqua mosaic console and hand-carved furniture with designer fabrics in ivory hues with lime and blue overtones. Private bathroom and furnished balcony surrounded by mature multi-coloured gardens offers unique moments of relaxation. A Family Apartment combined with a double guestroom through connecting doors form the Family Connecting Combo accommodating a total of 4 adults + 4 children. 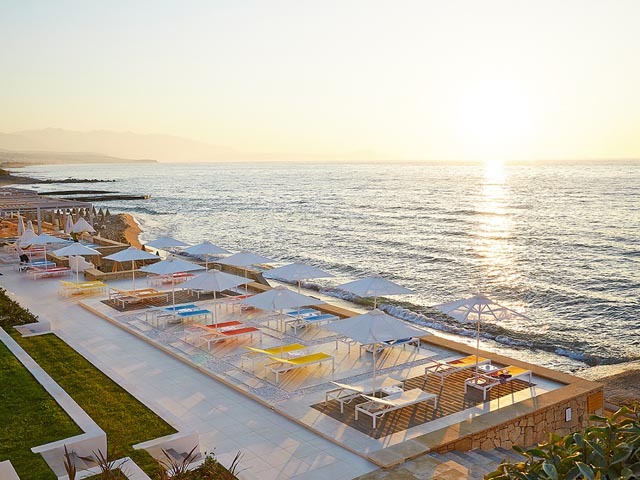 Brand new guestrooms with stunning sea views that capture the beauty and essence of the White Palace, Grecotel's newly updated chic beachfront retreat. Ideal for young families these spacious Junior Suites are decorated in shades of ivory and blue. Sleek metallic surfaces catch the reflections from a rainbow of hues, bathing these unique suites in rays of coloured light during the amazing Cretan sunset. Open-plan master bedroom with king-size bed and en-suite living area featuring two comfortable sofa beds ideal for two children. Private bathroom en suite, amazing walk in shower with breathtaking sea views and ample dressing area enrich the comforts of the family suite. These unique suites have floor-to-ceiling panoramic windows and spacious fully furnished covered balcony overlooking the legendary Cretan Sea. Ideal for families, these well-appointed Suites with front sea views offer luxury, comfort and versatility. Each Suite provides generously sized interiors with stylish décor featuring aqua-coloured mosaics and contrasting fabrics in shades of blue, turquoise and sand with pearl accents. The beautifully appointed living area facing the seafront includes two comfortable sofa beds and doubles as a sleeping room for two children. En-suite private bathroom. Separated by a sliding door the sea view master bedroom features a king-size bed, walk-in shower facing the sea and ample dressing space. Large glass panels offer seamless transitions between indoors and outdoors to enhance your stay. These unique suites feature two spacious balconies with bird-eye views over the Cretan Sea and relaxing furniture for endless rejuvenation. The magnificently elegant and well-appointed Grand Family Suites are specially designed for families or friends that want to share unique moments, while enjoying privacy and comfort. Each suite provides generous interiors with stylish décor featuring aqua-coloured mosaic consoles and hand-carved furniture with contrasting fabrics in shades of blue, lime and turquoise. The beautifully appointed spacious living area facing the seafront includes a lounge with two sofa beds that can be used as a children's bedroom. En suite private bathroom. Separate sea view master bedroom features a king-size bed, walk-in shower facing the sea and ample dressing space. A spacious corridor off the lounge area leads to a contemporary style boudoir featuring a spacious walk-in wardrobe and shower cabin just before entering the second sea view master bedroom. Large glass panels offer seamless transitions between indoors and outdoors to enhance your stay. 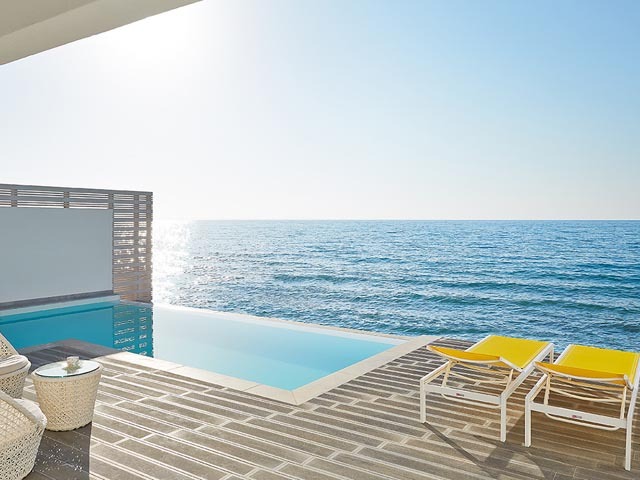 The suites feature two spacious balconies with bird-eye views over the Cretan Sea and relaxing furniture for endless rejuvenation. 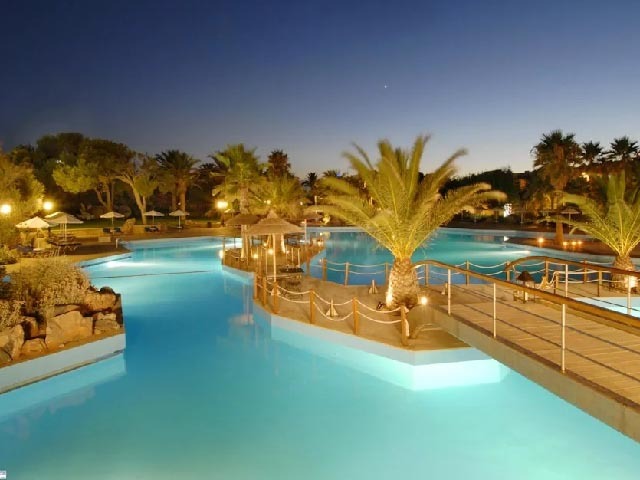 Prime Seafront location designed to offer guests the supreme comforts of a lavish holiday retreat. Ideal exclusive hideaway for couples celebrating a marriage or an anniversary Petit Yali accommodation is airy and elegantly casual with lavish touches, handpicked wooden furniture and rich colours in varying shades of ivory, cream and turquoise with lime and yellow accents that complement the styling. Master bedroom with a king size bed and en suite lounges decorated in contemporary style. Well-appointed seafront living area separated by sliding panels featuring a dreamy comfortable sofa which doubles as a sleeping area ideal for children. En suite private bathroom. Large glass panels for seamless transitions between indoors and outdoors. A hotspot for lovers or families sharing special moments by the beach and the quiet calm of the Yali Exclusive Pool, beautiful living awaits. No need to walk back to your room after a dip in the pool - paddle the entire way back to your own sun terrace with our unique Luxe Yali Suites. Well-appointed with exquisite custom designed furnishings and matching fabrics in varying shades of ivory, cream and turquoise. Hand-carved white woodwork and sleek metallic surfaces enhance the suite's airiness. Master bedroom suite with spa inspired private bathroom and separate walk-in shower facing the sea. Sea view living area with walk-in wardrobes and comfortable lounges that can accommodate two children. 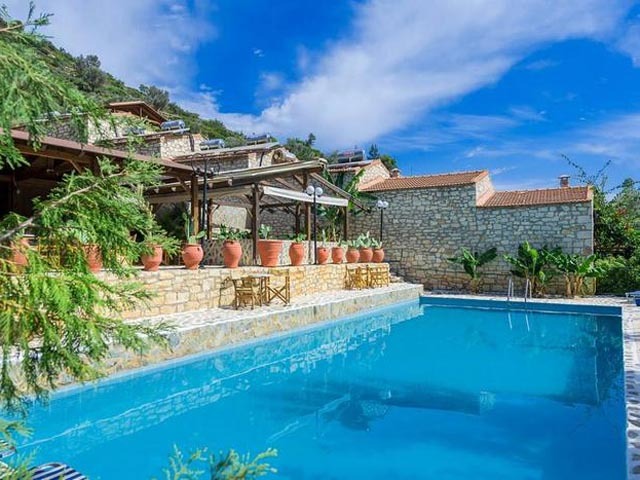 Oversized patio with comfy loungers providing awe-inspiring views over the Cretan Sea. Romance personified! Imagine walking directly from your room into a crystalline infinity pool-your Luxe Yali Suite is truly where love lives. A truly sublime retreat, these stunning open plan suites dazzle with refreshing allure, while from the bed to the bathtub every view is open to the outdoors. With comfort, beauty, and convenience at the forefront, including access to a private pool with sunken beds (certain villas) just steps away from the accented ivory-coloured bedroom suite, opulence is within reach at every turn. The master bedroom suite features a king size bed. Comfort is distinctly represented in every detail: from hand carved furniture to white side tables, consoles and matching fabrics with light blue and lemon touches. Special features include private spa-inspired bathroom stocked with Eau de Grèce signature bath amenities. It features two washbasins with ample vanity unit, separate shower cabin and Jacuzzi bathtub with inset phototherapy enjoying direct sea views. Complete with an expansive direct sea view living room that can accommodate two children, separate walk-in ample wardrobes, the Yali Grand Luxe Villas are among the resort’s most popular. And to enhance the villa's airiness the woodwork is painted white, while sleek metallic surfaces catch the reflections from a rainbow of hues, bathing the rooms in rays of coloured light during the amazing Cretan sunset. Glass doors can be folded to the side incorporating the waterfront veranda to create an amazing open plan oversized living space. 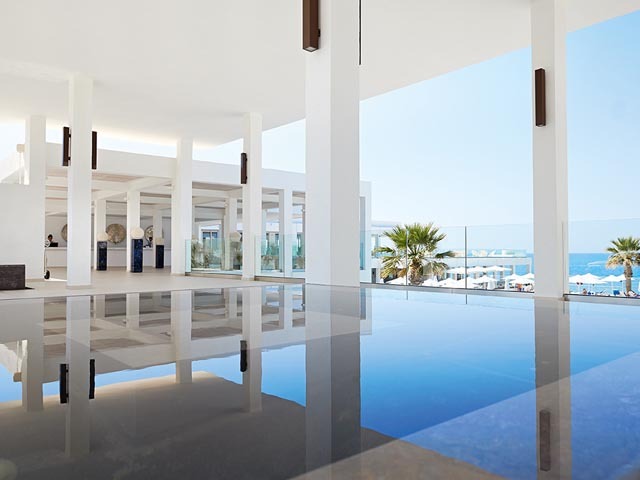 A private sun terrace and pool deck with outdoor shower offer panoramic views of the Cretan Sea. Comfortable furnishing including lavish loungers enhance entertainment beside the private heated pool. White Palace 2 Bedroom Villas are all about private space, incredible comfort and views, while each villa features a unique design. The luminous depth and ancient allure of white surfaces meet state-of-art qualities engineered for modern living. The views from the panoramic floor-to-ceiling glass doors make you feel that the Mediterranean is there just for your pleasure. As you lie in bed, listening to the waves breaking onto the shore, you think you could stretch out your toes and dip them into the water. 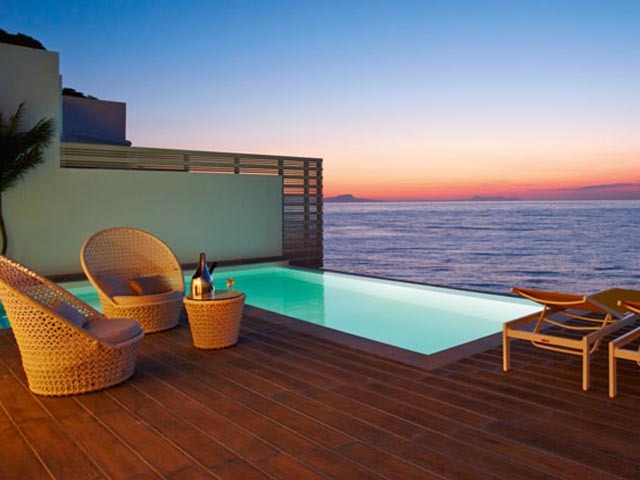 Sip a cocktail by your private pool on the seafront veranda as you watch the sun set over Rethymno Rivera. Enter a marvelous sleeping and living area with open-plan design featuring a king size bed placed next to the floor-to-ceiling door and comfortable lounges facing outdoors that can accommodate two children. Stylishly cool environment with hand carved custom-made furniture, white-colored side tables, consoles and matching fabrics with light blue and lemon touches. It features panoramic sea views, while glass doors can be folded to the side incorporating the waterfront veranda to create an amazing open-plan oversized suite. Separate WC stocked with Eau de Grèce signature bath amenities and ample wardrobes. The extravagant master bedroom suite features a lavish bedroom, spa-inspired bathroom featuring an imposing standing bathtub, two washbasins with ample vanity unit, separate shower cabin and ample walk-in wardrobes. Eau de Grèce signature bath amenities to enhance your relaxation. The oversized bed (2.00mX2.10m) is set against a theatrical backdrop of wooden details with a distinct vintage design and offers amazing direct views over the infinity pool and the Cretan Sea. Exceptional outdoors: generous spaced private terrace with infinity pool offers the perfect setting for relaxed summer entertaining. 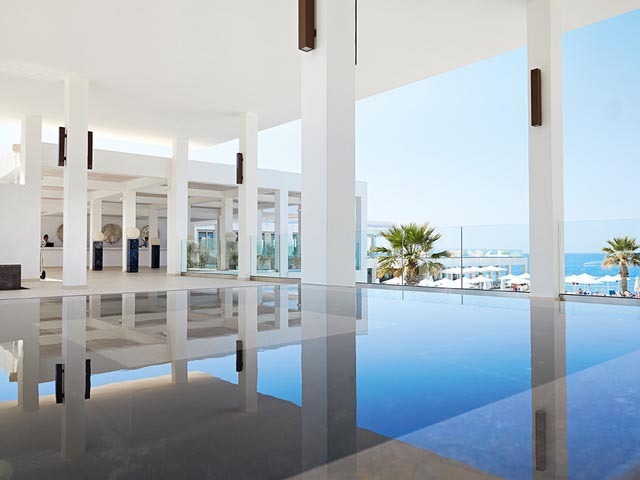 A horizon swimming pool merges with the azure seascape and overlooks Rethymno Riviera. Outdoor shower, large umbrellas and stylish comfy loungers. 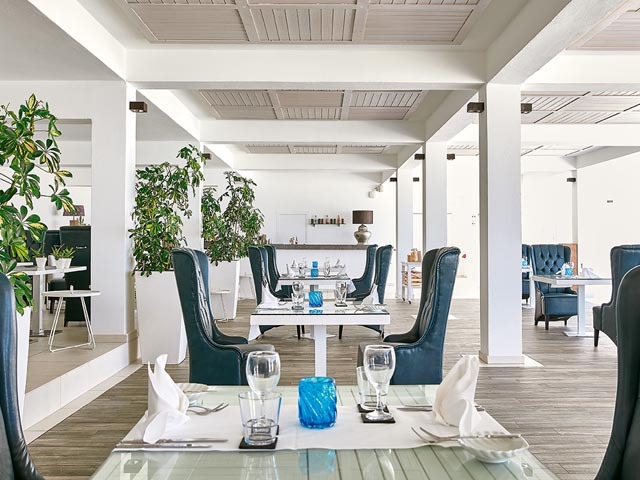 Fine dining overlooking the Cretan Riviera and a menu with international flair. 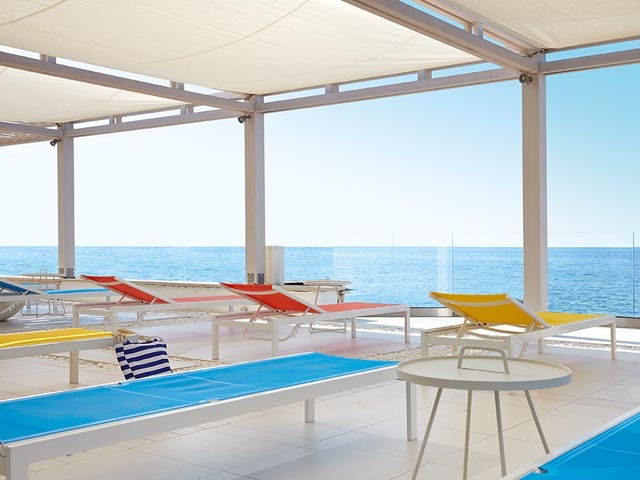 White Palace welcomes you to its new fantastic restaurants & bars overhanging the Cretan Sea. 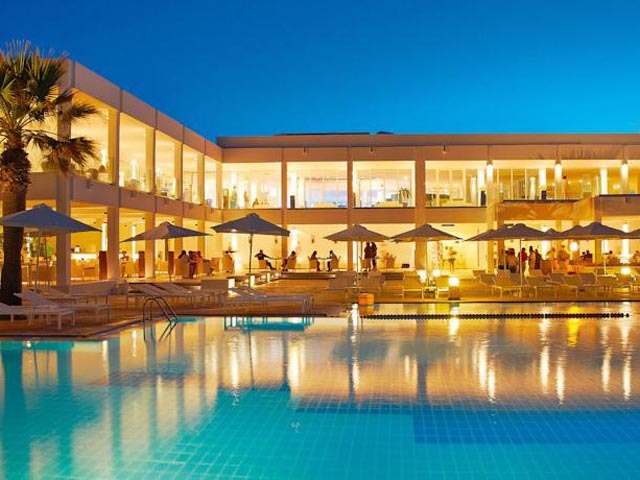 It features six restaurants offering a la carte menus from Greek, Italian, Thai, French and Fusion cuisine prepared with the freshest ingredients as well as an international buffet-style restaurant. Restaurants at the White Palace are complemented by fine wines and exemplary service. Choose from an extensive menu, day or night, for quiet, in room private dining or a romantic dinner under the stars. At the Tasty Corner, children can eat throughout the day at no extra charge. Elegant restaurant with stunning views over Rethymno Old Town and the Cretan Sea. 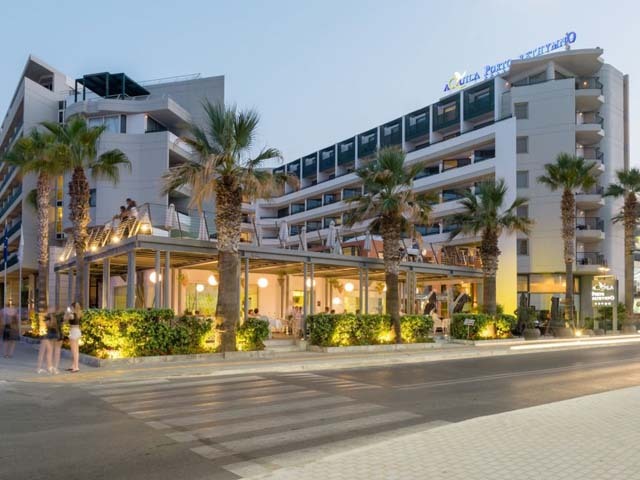 Offering superior all-day dining with international appeal, White Palace features traditional Greek and Cretan dishes and extends to the rest of the world. Culinary options range from Mediterranean dishes of delectable quality to a menu of global scale. Guests will appreciate the opportunity to dine al fresco on the wide terrace overlooking the pool and the infinite sea. 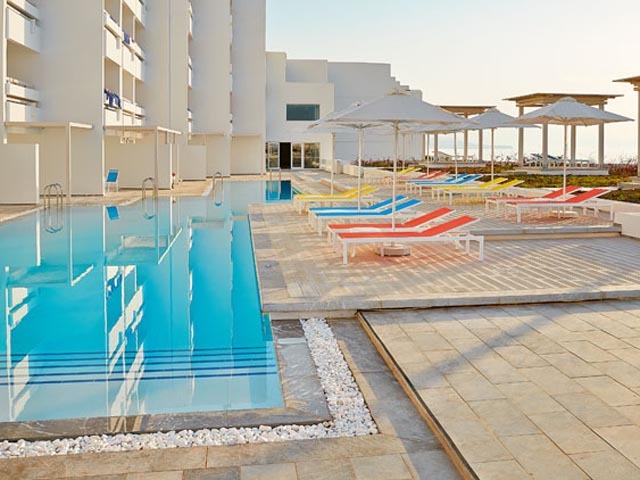 Guests can enjoy generous buffet-style breakfast - including Cretan Corner, healthy and vegetarian options and an extensive international buffet with Mediterranean overtones for breakfast, lunch and dinner. Don't miss specialty dishes on themed evenings. Tasty Corner Kids free dining and children's menu are also available. It’s all about the whites of Greece with a view to the blue hues of the sea. Named after color white, the restaurant ideally located at the lobby level offers a selection of menus degustation celebrating beloved world cuisines enjoyed on a magnificent sea-blue terrace. Fine seafood and a taste of the Mediterranean are served at an incredible location which stirs the emotions. Choose between ‘White Tasting’, ‘Degustazione Bianco’ and ‘Degustation Blanc’—three unique gastronomy concepts created around seasonal ingredients and infused with ethnic overtones. 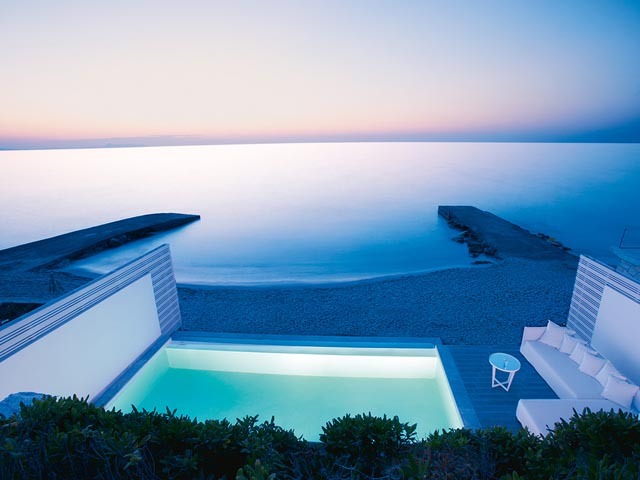 Highlight: Panoramic sunset of the island: the sun dives into the Cretan Sea, home of the island’s mythical background. Savour the taste of Thailand in a brand new venue that captures the essence of this exotic culinary passion for dining in a restaurant of animated activity, sizzling spirit, and aromatic overdrive. Try Budoo’s a la carte menu, developed to include the very best of Thai delicacies. Thai cocktails and fine wines from the White Palace Cava complement a contemporary approach to exotic palatable delights. Figo Di India defines Italian lounging. With a refined atmosphere and an exquisite a la carte menu of authentic Italian cuisine, this unique All-day Pool Bar Restaurant is lounging at its finest. 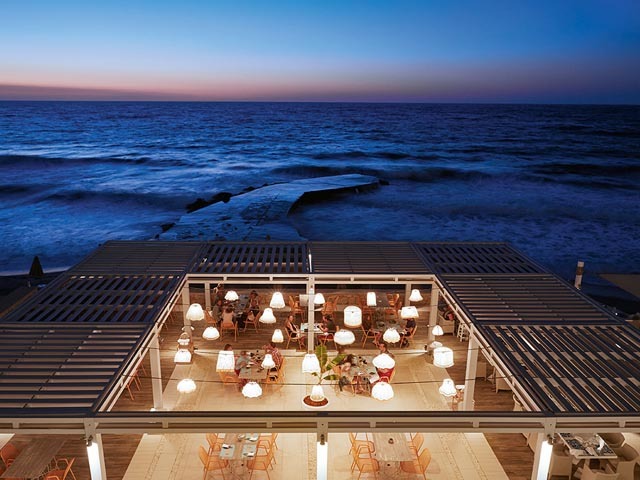 After sunset, Figo Di India evolves into a relaxed, laid back venue. Enjoy delicious Italian flavours in the al fresco dining area and live entertainment or allow relaxing music to soothe your mind. Relax with your favourite espresso or try the unique masticha drink in this lively heart of the resort-a place to meet and enjoy the spirit of the White Palace from a seat of luxury. Book NOW and Save up to 30% !! Kids up to 14 Years old Stay Free of Chagre !! The offer is valid ONLY FOR GREEK Citizens ! !